Swiss company RUAG will be setting up base at United Launch Alliance’s Decatur facility in Alabama, following a deal to further strengthen their cooperation. RUAG are best known for their production of payload fairings for a number of launch vehicles. 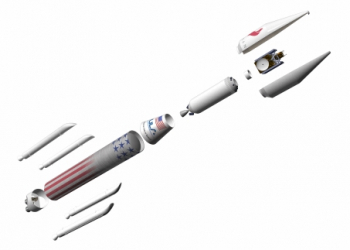 However, the deal is also aimed at providing additional composite hardware specific to ULA’s Vulcan rocket. RUAG Space has been in the fairing business since 1974 and has been responsible for the development and production of all Ariane launcher payload fairings. The company currently produces fairings for the Ariane 5, the Atlas V-500 launch vehicles as well as for the small European Launcher, Vega. 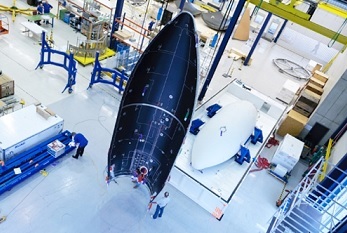 Production of the Ariane and Vega fairings will continue in Zurich/Emmen – before being shipped from Emmen to the Kourou launch site via the Antonov 124 cargo plane. As such, no job losses in Switzerland are expected. RUAG will also be fabricating the fairings for the Ariane 6 rocket. Production of Atlas V and Vulcan fairings will now move to Decatur, per this week’s announcement. 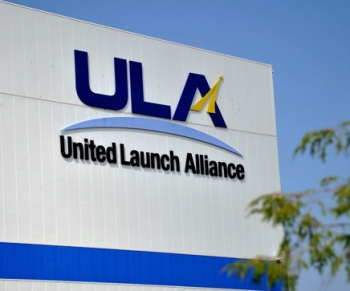 “We are pleased with this new partnership that leverages so many mutually beneficial business objectives, while substantially lowering costs,” noted Tory Bruno, ULA’s president and CEO. 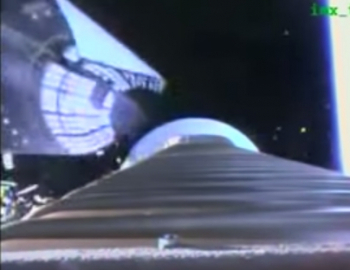 The continued production of the Atlas V fairings – along with existing contracts relating to the interstage adaptor for the Atlas V-400 – will be boosted by the proposed fabrication of several new additional structures for the recently announced ULA Vulcan rocket. RUAG note their fairings are built with composite technology based on aluminum honeycomb cores with carbon fiber reinforced plastic face sheets. This construction method allows the combination of low mass with high stiffness. Their role with the Vulcan rocket may allow them to branch out into hardware elements such as engine heat shields, inter tanks, inter stages, payload adapters and boat tails – with Vulcan aiming to utilize reusable technologies. RUAG production in Decatur is expected to begin in mid-2017 to early 2018. Having a base in the United States may also prove to be beneficial for RUAG’s potential role with the Space Launch System (SLS). In previously reported efforts by SLS managers to advertise and further evaluate the Heavy Lift Launch Vehicle’s versatility, documentation (acquired by L2) portrayed one of the payload fairing options that could be used by SLS – specific to robotic spacecraft. 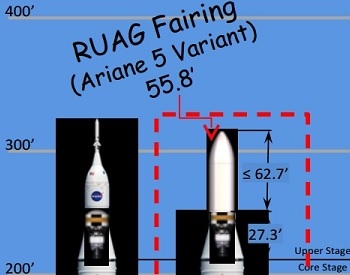 Titled as “Objective: Determine the Technical Feasibility of Utilizing a RUAG 5.4m PLF on SLS Vehicles & Define a Potential Partnership Approach to Develop the System,” the overview is based on using an Ariane 5 style fairing atop of the SLS. The intent, as noted by the presentation, is to reconcile the differences between the assessments by the end of study process. Associating with SLS will please local lawmakers, who have already noted their pleasure at the deal with ULA – with 100 new jobs expected to be generated. Most of those jobs will be new hires, in conjunction with some specialists already embedded with RUAG. “This exciting, new partnership highlights the fact that North Alabama continues to thrive in its long-standing position as a leader in space capabilities,” Sen. Richard Shelby noted – himself a strong supporter of both ULA and SLS. The move will also provide RUAG with additional benefits, such as reducing transportation costs associated with shipping fairings from Europe to the United States while also eliminating currency risks relating to contracts.